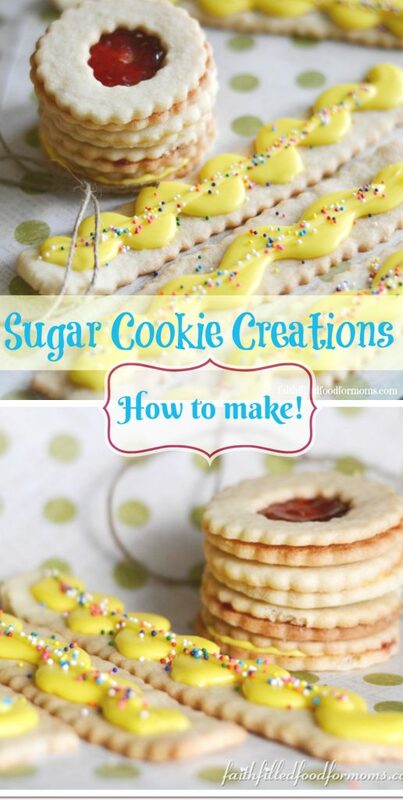 With Christmas just weeks away and office parties, cookie exchanges, bake sales and country fairs going strong, I wanted to show you a super simple way to make Sugar Cookie Creations that look so lovely ~ are SO tasty and most of all SO EASY to make! My son, who is performing in Peter Pan at his High School, needed some baked goods to sell at the concession stand. So I created these little goodies and packaged them all up nice and pretty and they were such a big hit! The best part…it took me no time at all! So I made those fun long cookies and packaged them in long Pretzel Bags and I made the Jelly Filled Cookies and packaged them as well along with some Snowball Cookies too! 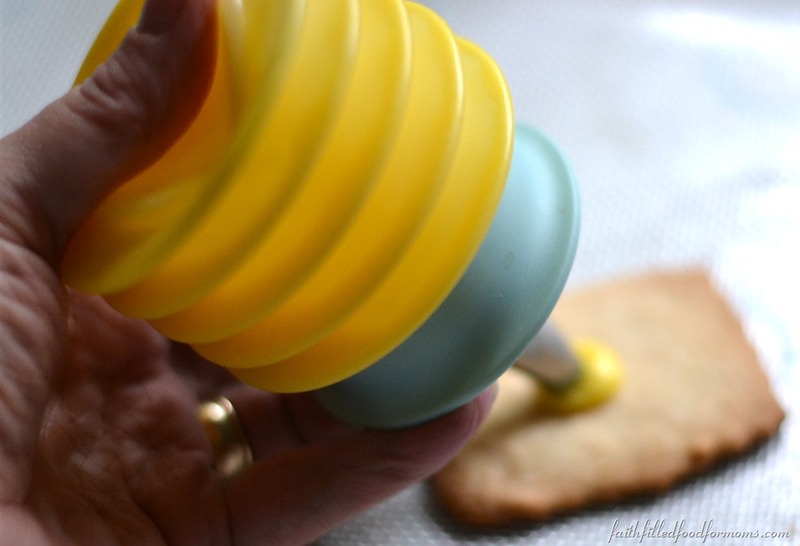 Cookie/Cake Decorating Bottles ~ These make decorating SO EASY! If you are not familier with the squeezy bags, this is definitely the way to go! 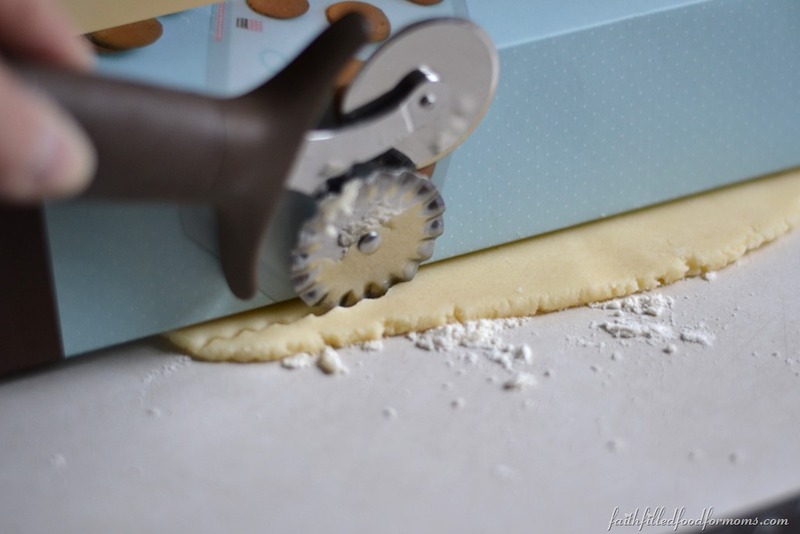 Pastry Wheel ~ Can be used for SO many other things besides cookie decorating. 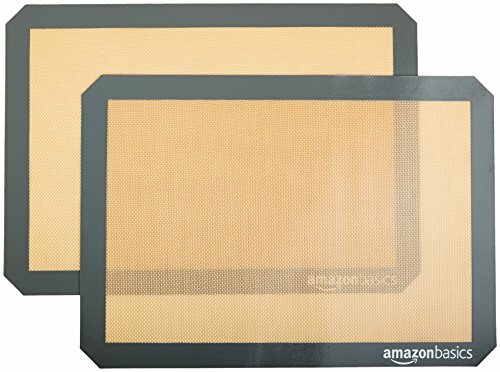 Silicone Baking Mat ~ I am in LOVE with my Silicone Baking Mats. Nothing sticks and it is the EASIEST CLEAN UP…EVER! See below for how beautiful the cookies come out. 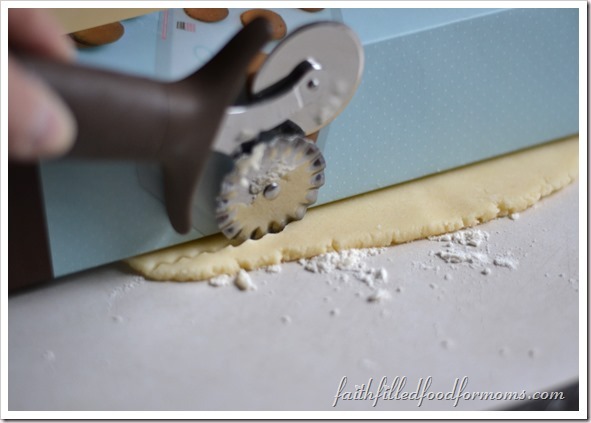 So I set about baking my Sugar Cookie Creations project… by making my Homemade Sugar Cookies dough first then…. 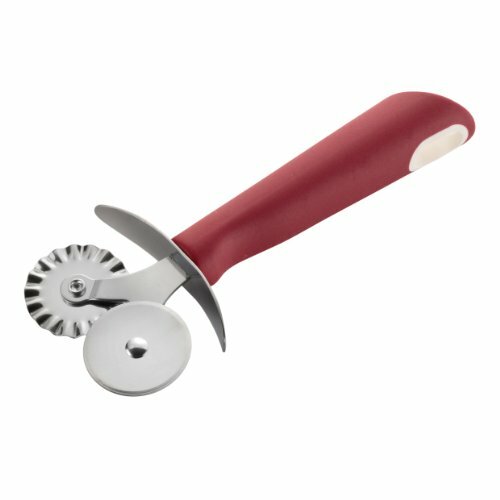 I cut some of my shapes using the pastry wheel! This was fun and worked perfectly for what I had in mind…I used a box for cutting a straight line. 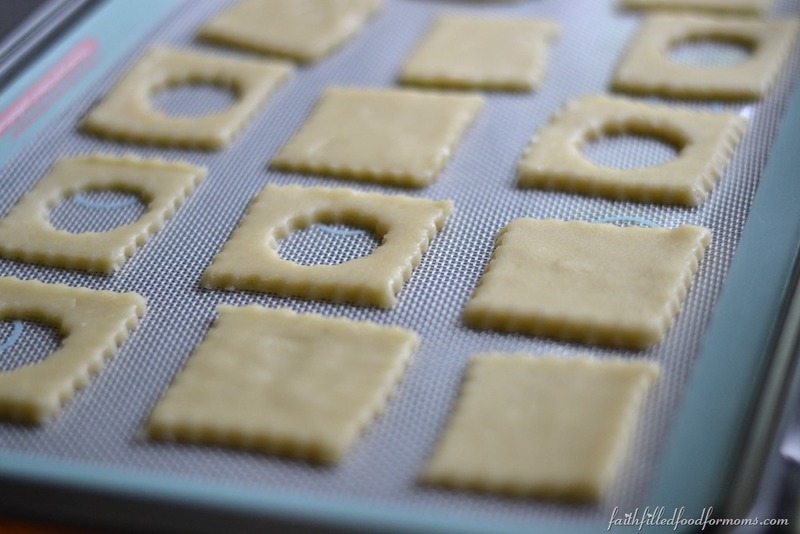 Then I placed my shapes onto the Silicone Baking Mat that was set in my Baking Sheet. Cookies bake SO evenly on these baking mats, they come out almost perfectly. 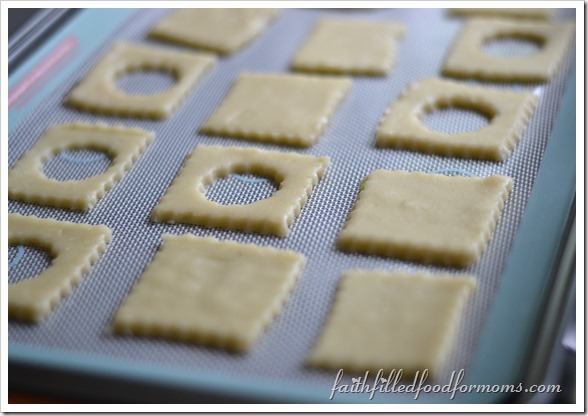 Taking the cookies off of the Baking Mat is so easy too. I don’t spray the Mat or anything and I can lift off with my fingers! 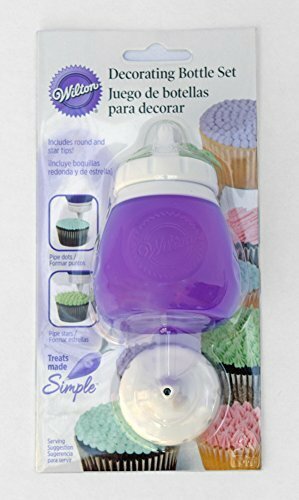 I also LOVE using the frosting/decorator bottles WAY more than using pastry bags. Way easier to get your decorations even. Especially if you are new to cookie decorating. By the way ~ all I did to make the jelly filled cookies, was to cut a hole in the middle of some of the cookies with a small cookie cutter before baking. You could use any shape or size which makes it all the more fun. Then add your favorite little jelly in the middle and bake! 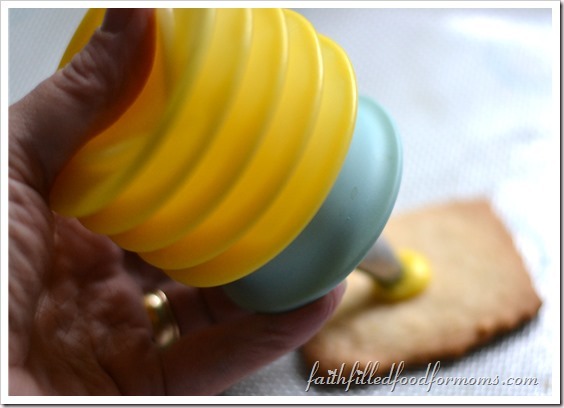 Just use a little jelly (1/2 tsp or so) or it will come out the edges and make a mess. 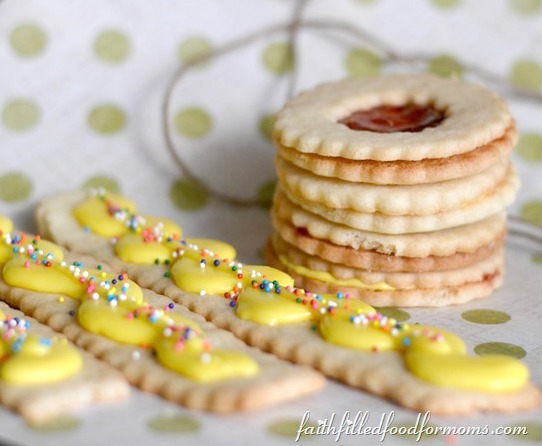 Here is the full recipe for the Sugar Cookies. I didn’t put it in the post because it would have been way too long. Happy Baking, bake sales, cookie exchanges! !